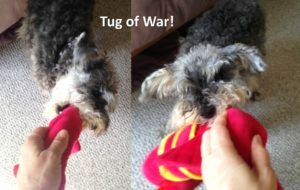 Tug of war can be a fun game to play with your pup! Let’s put the myth to bed that tug of war is bad. 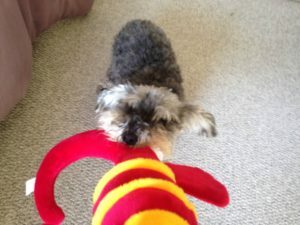 It is not true that playing tug of war with your dog will teach your dog to be dominant. It’s PLAY! Have fun! As long as your dog is not aggressive with you and you are training and exercising him properly, this is simply a fun way to interact and blow off some steam. The reason is that you might need to tell him to stop if he’s getting too riled up or you’re finished playing. Also, you want to make sure he doesn’t try to play tug with your favorite shoe, pillow, or blouse! 2. Use 1-2 toys designated for tug. See above. This makes it clear which things he’s allowed to pull on and which things (including his toys) you do not want him to rip apart. 3. Don’t play with edible objects. Bones are not tug toys – THAT’S resource guarding! 4. History of tug. Many people believe that tug is actually a mutual helping game – not a competition. Think of 2 wolves trying to rip open a dead animal’s carcass. It’s tug of war! There are many other theories, but I have heard and believe this one the most given all I’ve seen & read about this game. Overall the results of this study suggest that the way dogs play is a reflection of their temperament, learning history, and general relationship with their owner. In no way do the games dogs play with humans affect the dominance aspect of a relationship.